You are here: Home / Tours and Live Performances / 2015 The Original High / Adam Lambert Headlining at World Series of Beach Volleyball This Saturday! 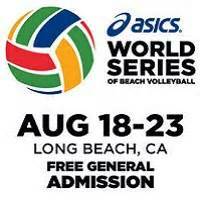 Adam Lambert will take the stage twice on Saturday, August 22, 2015 at the World Series of Beach Volleyball in Long Beach, CA. First at 1 PM, which is televised internationally on NBC for one song, then he headlines the stage later that night to close the show. The best news for everyone saving up for next year’s tour is . . . it’s FREE! That’s right! Entrance to the full day of world-class beach volleyball and the concert that night which also features eight other performers, is free! You can also buy a premium ticket for $60 that day, which includes lunch and will also give you first access to the stage where Adam will be performing. So if you weren’t lucky enough to make it to Morongo or aren’t going down under for his Australian shows in January, hopefully you can make it to Southern California Saturday for his 30-minute set! Go to www.wsobv.com for all the details. And here’s a cute one for you – let’s play the Six Degrees of Kevin Bacon connecting Adam and the Olympics, two words we never thought we’d hear in the same sentence, right?! Okay – did you get it? It’s pretty simple. 1. The Summer Olympics 2016 will be in Rio de Janeiro. 2. Rio de Janeiro is hosting Rock in Rio in September. 3. Queen is playing Rock in Rio. 4. Adam is lead singing with Queen! I’m excited to spend a beautiful day at the beach, see some world-class volleyball, meet up with dear friends, inspire some new Glamberts, see one of my other favorite bands American Authors, hear some new bands plus finish the night with the amazing Adam Lambert! Here are some important notes explaining the line-up and all the questions that must have flooded the WSOBV twitter! They’re excited to have the Glamberts attending! Signs of the Glambert Passion! And of course, here’s Adam’s excitement about being included! I'm headlining the #WSOBV festival by @iHeartRadio on Aug 22 in Long Beach, CA! It's free – I'll see you on the beach! It’s a nice gig for Adam. Hope there is more to come.